Claire and I had "finely cut sandwiches, freshly baked scones, jam and clotted cream and a range of delicate pastries" for dinner last night. That's because we went and had high tea at The Ritz in London. What a splendid evening it was too. Now we didn't plan this. One of Claire's colleague was scheduled to go last night as part of this birthday celebrations, but unfortunately, one of his kids came down with something, so they couldn't go. The voucher they had had already been extended once and the reservation already made. So rather than try reschedule or possibly not use the voucher at all, he offered it to the peeps at work. Claire was quick to jump at the offer, and off we went all suited and booted for high tea at the Ritz. Our booking was for 7:30pm - a bit late for tea, but who cares. 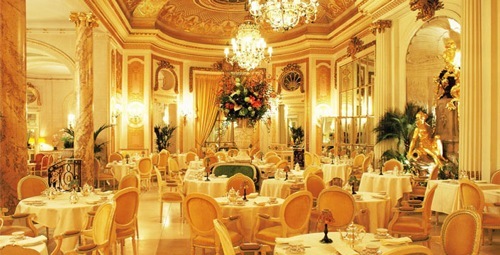 Tea at The Ritz is served in the Palm Court in the middle of the hotel and apparently has been (and still is) frequented by the rich and famous since 1906, including the likes of King Edward VII, Charlie Chaplin, Winston Churchill, royalty, heads of state and even modern celebs like Julia Roberts, Johnny Depp and Hugh Grant. Sadly, we didn't see any celebs last night, however we certainly felt like royalty. The immaculately turned out staff make everyone feel like royalty with their politeness and eagerness to please. It really felt truly English. The tea itself was surprisingly filling. We had a choice of leaf teas to choose from which was served in silver teapots, with a matching milk jug, tea strainer and cake stand. The crockery itself was fine bone china with a delicate pattern on it. We didn't turn the saucers over to see who made them, but we'll guess it was someone like Wedgewood. Once seated and our tea ordered - I went for the Darjeeling and Claire had the Assam - the 3 tier silver cake stand arrived with a selection of finger sandwiches, at the bottom and some rather fine and delicious looking pastries on the top. A little while later the middle plate was whipped away and returned with 4 fresh scones and two slices of fruit cake, to be accompanied by the jam and clotted cream already on the table. In a word: WOW! I didn't know you could make tea so tasty. The sandwiches were lovely and fresh, the scones light and soft, but without being cakey, the clotted cream as heavy as you could want clotted cream to be, but without being too heavy or buttery, and the pastries were spectacular. One thing of note was the strawberries and raspberries on two of the pastries were amazing. They were fresh and bursting with flavour, unlike the berries you buy in the supermarket. All in all it was a lovely evening. I can't say I'd have ever added this to the list of things I must do in London, but I'm glad I can say I have.